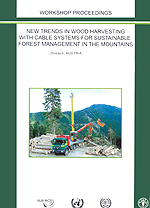 The papers in this publication were presented at the Workshop on New Trends in Wood Harvesting with Cable Systems for Sustainable Forest Management in the Mountains which was held from 18 to 24 June 2001 at the Forestry Training Centre in Ossiach (Austria) at the invitation of the Government of Austria and under the auspices of the Joint FAO/ECE/ILO Committee on Forest Technology, Management and Training. This publication contains the papers submitted at the Workshop and is preceded by the Report on the Workshop that was adopted at its conclusion. This Workshop Report in English was translated into French and Russian and these translations are also included. The papers are presented in the language provided by their authors (mostly English) with summaries in the other two languages for most of the papers. All opinions expressed in these papers are those of the authors. The organizers and the secretariat of the Joint Committee cannot accept responsibility for the accuracy of any statistics or statements included in the papers. These papers appear as presented by the authors with the exception of later corrections and editorial revisions. International Union of Forest Research Organizations (IUFRO). Support and funding for the Workshop and this publication were provided by FAO and the Government of Austria through a Trust Fund.